Exercise-Induced Activated Platelets Increase Adult Hippocampal Precursor Proliferation and Promote Neuronal Differentiation. Physical activity is a strong positive physiological modulator of adult neurogenesis in the hippocampal dentate gyrus. Although the underlying regulatory mechanisms are still unknown, systemic processes must be involved. Here we show that platelets are activated after acute periods of running, and that activated platelets promote neurogenesis, an effect that is likely mediated by platelet factor 4. Ex vivo, the beneficial effects of activated platelets and platelet factor 4 on neural precursor cells were dentate gyrus specific and not observed in the subventricular zone. 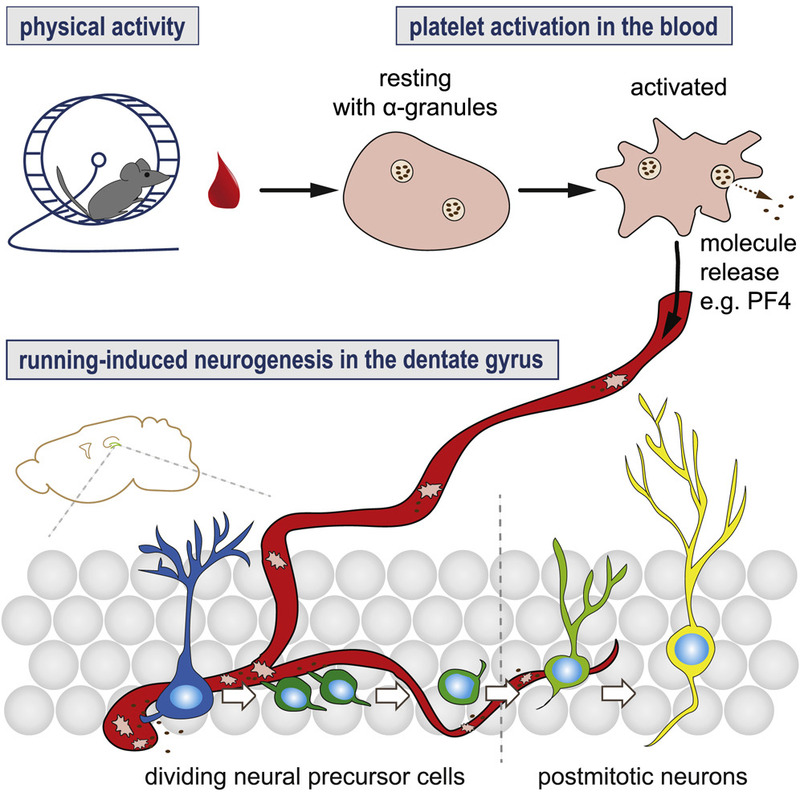 Moreover, the depletion of circulating platelets in mice abolished the running-induced increase in precursor cell proliferation in the dentate gyrus following exercise. These findings demonstrate that platelets and their released factors can modulate adult neural precursor cells under physiological conditions and provide an intriguing link between running-induced platelet activation and the modulation of neurogenesis after exercise. Platelets kill circulating parasites of all major Plasmodium species in human malaria. Platelets are understood to assist host innate immune responses against infection, although direct evidence of this function in any human disease, including malaria, is unknown. Here we characterized platelet-erythrocyte interactions by microscopy and flow cytometry in patients with malaria naturally infected with Plasmodium falciparum, Plasmodium vivax, Plasmodium malariae, or Plasmodium knowlesi Blood samples from 376 participants were collected from malaria-endemic areas of Papua, Indonesia, and Sabah, Malaysia. Platelets were observed binding directly with and killing intraerythrocytic parasites of each of the Plasmodium species studied, particularly mature stages, and was greatest in P vivax patients. Platelets preferentially bound to the infected more than to the uninfected erythrocytes in the bloodstream. Analysis of intraerythrocytic parasites indicated the frequent occurrence of platelet-associated parasite killing, characterized by the intraerythrocytic accumulation of platelet factor-4 and terminal deoxynucleotidyl transferase deoxyuridine triphosphate nick-end labeling of parasite nuclei (PF4+TUNEL+ parasites). These PF4+TUNEL+ parasites were not associated with measures of systemic platelet activation. Importantly, patient platelet counts, infected erythrocyte-platelet complexes, and platelet-associated parasite killing correlated inversely with patient parasite loads. These relationships, taken together with the frequency of platelet-associated parasite killing observed among the different patients and Plasmodium species, suggest that platelets may control the growth of between 5% and 60% of circulating parasites. Platelet-erythrocyte complexes made up a major proportion of the total platelet pool in patients with malaria and may therefore contribute considerably to malarial thrombocytopenia. Parasite killing was demonstrated to be platelet factor-4-mediated in P knowlesi culture. Collectively, our results indicate that platelets directly contribute to innate control of Plasmodium infection in human malaria. Kho S, Barber BE, Johar E, et al. Platelets kill circulating parasites of all major species in human malaria. Blood. 2018;132(12):1332-1344. Emerging importance of chemokine receptor CXCR3 and its ligands in cardiovascular diseases. The CXC chemokines, CXCL4, -9, -10, -11, CXCL4L1, and the CC chemokine CCL21, activate CXC chemokine receptor 3 (CXCR3), a cell-surface G protein-coupled receptor expressed mainly by Th1 cells, cytotoxic T (Tc) cells and NK cells that have a key role in immunity and inflammation. However, CXCR3 is also expressed by vascular smooth muscle and endothelial cells, and appears to be important in controlling physiological vascular function. In the last decade, evidence from pre-clinical and clinical studies has revealed the participation of CXCR3 and its ligands in multiple cardiovascular diseases (CVDs) of different aetiologies including atherosclerosis, hypertension, cardiac hypertrophy and heart failure, as well as in heart transplant rejection and transplant coronary artery disease (CAD). CXCR3 ligands have also proven to be valid biomarkers for the development of heart failure and left ventricular dysfunction, suggesting an underlining pathophysiological relation between levels of these chemokines and the development of adverse cardiac remodelling. The observation that several of the above-mentioned chemokines exert biological actions independent of CXCR3 provides both opportunities and challenges for developing effective drug strategies. In this review, we provide evidence to support our contention that CXCR3 and its ligands actively participate in the development and progression of CVDs, and may additionally have utility as diagnostic and prognostic biomarkers. Altara R, Manca M, Brandão RD et al., Clin Sci (Lond). 2016 Apr 1;130(7):463-78. doi: 10.1042/CS20150666. The Chemokine Platelet Factor-4 Variant (PF-4var)/CXCL4L1 Inhibits Diabetes-Induced Blood-Retinal Barrier Breakdown. PURPOSE: To investigate the expression of platelet factor-4 variant (PF-4var/CXCL4L1) in epiretinal membranes from patients with proliferative diabetic retinopathy (PDR) and the role of PF-4var/CXCL4L1 in the regulation of blood-retinal barrier (BRB) breakdown in diabetic rat retinas and human retinal microvascular endothelial cells (HRMEC). METHODS: Rats were treated intravitreally with PF-4var/CXCL4L1 or the anti-vascular endothelial growth factor (VEGF) agent bevacizumab on the first day after diabetes induction. Blood-retinal barrier breakdown was assessed in vivo with fluorescein isothiocyanate (FITC)-conjugated dextran and in vitro in HRMEC by transendothelial electrical resistance and FITC-conjugated dextran cell permeability assay. Occludin, vascular endothelial (VE)-cadherin, hypoxia-inducible factor (HIF)-1α, VEGF, tumor necrosis factor (TNF)-α, receptor for advanced glycation end products (RAGE), caspase-3 levels, and generation of reactive oxygen species (ROS) were assessed by Western blot, enzyme-linked immunosorbent assays, or spectrophotometry. RESULTS: In epiretinal membranes, vascular endothelial cells and stromal cells expressed PF-4var/CXCL4L1. In vitro, HRMEC produced PF-4var/CXCL4L1 after stimulation with a combination of interleukin (IL)-1β and TNF-α, and PF-4var/CXCL4L1 inhibited VEGF-mediated hyperpermeability in HRMEC. In rats, PF-4var/CXCL4L1 was as potent as bevacizumab in attenuating diabetes-induced BRB breakdown. This effect was associated with upregulation of occludin and VE-cadherin and downregulation of HIF-1α, VEGF, TNF-α, RAGE, and caspase-3, whereas ROS generation was not altered. CONCLUSIONS: Our findings suggest that increasing the intraocular PF-4var/CXCL4L1 levels early after the onset of diabetes protects against diabetes-induced BRB breakdown. Abu El-Asrar AM, Mohammad G, Nawaz MI et al., Invest Ophthalmol Vis Sci. 2015 Feb 24;56(3):1956-64. doi: 10.1167/iovs.14-16144. CXCR3, a double-edged sword in tumor progression and angiogenesis. CXC chemokines are involved in chemotaxis, regulation of cell growth, induction of apoptosis and modulation of angiostatic effects. CXCL9, CXCL10, CXCL11, CXCL4 and its variant CXCL4L1 are members of the CXC chemokine family, which bind to the CXCR3 receptor to exert their biological effects. These chemokines are associated with a variety o f human diseases including chronic inflammation, immune dysfunction, cancer and metastasis. In this review, we focus on accumulating evidence demonstrating the pivotal role of CXCR3 in tumor progression. Its effects are mediated directly in tumor cells or indirectly through the regulation of angiogenesis and tumor immunity. Understanding the emerging role of CXCR3 and its signaling mechanisms further validates this receptor as a biomarker and therapeutic target for tumor progression and tumor angiogenesis. Billottet C, Quemener C, Bikfalvi A Biochim Biophys Acta. 2013 Dec;1836(2):287-95. doi: 10.1016/j.bbcan.2013.08.002. Epub 2013 Aug 27. PF-4var/CXCL4L1 predicts outcome in stable coronary artery disease patients with preserved left ventricular function. BACKGROUND: Platelet-derived chemokines are implicated in several aspects of vascular biology. However, for the chemokine platelet factor 4 variant (PF-4var/CXCL4L1), released by platelets during thrombosis and with different properties as compared to PF-4/CXCL4, its role in heart disease is not yet studied. We evaluated the determinants and prognostic value of the platelet-derived chemokines PF-4var, PF-4 and RANTES/CCL5 in patients with stable coronary artery disease (CAD). METHODOLOGY/PRINCIPAL FINDINGS: From 205 consecutive patients with stable CAD and preserved left ventricular (LV) function, blood samples were taken at inclusion and were analyzed for PF-4var, RANTES, platelet factor-4 and N-terminal pro-B-type natriuretic peptide (NT-proBNP). Patients were followed (median follow-up 2.5 years) for the combined endpoint of cardiac death, non-fatal acute myocardial infarction, stroke or hospitalization for heart failure. Independent determinants of PF-4var levels (median 10 ng/ml; interquartile range 8-16 ng/ml) were age, gender and circulating platelet number. Patients who experienced cardiac events (n = 20) during follow-up showed lower levels of PF-4var (8.5 [5.3-10] ng/ml versus 12 [8-16] ng/ml, p = 0.033). ROC analysis for events showed an area under the curve (AUC) of 0.82 (95% CI 0.73-0.90, p<0.001) for higher NT-proBNP levels and an AUC of 0.32 (95% CI 0.19-0.45, p = 0.009) for lower PF-4var levels. Cox proportional hazard analysis showed that PF-4var has an independent prognostic value on top of NT-proBNP. CONCLUSIONS: We conclude that low PF-4var/CXCL4L1 levels are associated with a poor outcome in patients with stable CAD and preserved LV function. This prognostic value is independent of NT-proBNP levels, suggesting that both neurohormonal and platelet-related factors determine outcome in these patients. De Sutter J, Van de Veire NR, Struyf S et al., PLoS One. 2012;7(2):e31343. doi: 10.1371/journal.pone.0031343. Epub 2012 Feb 23. Platelet factor 4 regulation of monocyte KLF4 in experimental cerebral malaria. Cerebral malaria continues to be a difficult to treat complication of Plasmodium falciparum infection in children. We have shown that platelets can have major deleterious immune functions in experimental cerebral malaria (ECM). One of the platelet derived mediators we have identified as particularly important is platelet factor 4/CXCL4. Our prior work demonstrated that PF4(-/-) mice are protected from ECM, have reduced plasma cytokines, and have reduced T-cell trafficking to the brain. We now show that PF4 drives monocyte cytokine production in a Kruppel like factor 4 (KLF4) dependent manner. Monocyte depleted Plasmodium berghei infected mice have improved survival, and KLF4 is greatly increased in control, but not monocyte depleted mice. PF4(-/-) mice have less cerebral monocyte trafficking and no change in KLF4 expression. These data indicate that PF4 induction of monocyte KLF4 expression may be an important step in the pathogenesis of ECM. Srivastava K, Field DJ, Aggrey A, Yamakuchi M, Morrell CN. Platelet factor 4 regulation of monocyte KLF4 in experimental cerebral malaria. PLoS ONE. 2010;5(5):e10413. The COOH-terminal peptide of platelet factor-4 variant (CXCL4L1/PF-4var47-70) strongly inhibits angiogenesis and suppresses B16 melanoma growth in vivo. Chemokines influence tumor growth directly or indirectly via both angiogenesis and tumor-leukocyte interactions. Platelet factor-4 (CXCL4/PF-4), which is released from alpha-granules of activated platelets, is the first described angiostatic chemokine. Recently, it was found that the variant of CXCL4/PF-4 (CXCL4L1/PF-4var) could exert a more pronounced angiostatic and antitumoral effect than CXCL4/PF-4. However, the molecular mechanisms of the angiostatic activities of the PF-4 forms remain partially elusive. Here, we studied the biological properties of the chemically synthesized COOH-terminal peptides of CXCL4/PF-4 (CXCL4/PF-4(47-70)) and CXCL4L1/PF-4var (CXCL4L1/PF-4var(47-70)). Both PF-4 peptides lacked monocyte and lymphocyte chemotactic activity but equally well inhibited (25 nmol/L) endothelial cell motility and proliferation in the presence of a single stimulus (i.e., exogenous recombinant fibroblast growth factor-2). In contrast, when assayed in more complex angiogenesis test systems characterized by the presence of multiple mediators, including in vitro wound-healing (2.5 nmol/L versus 12.5 nmol/L), Matrigel (60 nmol/L versus 300 nmol/L), and chorioallantoic membrane assays, CXCL4L1/PF-4var(47-70) was found to be significantly (5-fold) more angiostatic than CXCL4/PF-4(47-70). In addition, low (7 microg total) doses of intratumoral CXCL4L1/PF-4var (47-70) inhibited B16 melanoma growth in mice more extensively than CXCL4/PF-4(47-70). This antitumoral activity was predominantly mediated through inhibition of angiogenesis (without affecting blood vessel stability) and induction of apoptosis, as evidenced by immunohistochemical and fluorescent staining of B16 tumor tissue. In conclusion, CXCL4L1/PF-4var(47-70) is a potent antitumoral and antiangiogenic peptide. These results may represent the basis for the design of CXCL4L1/PF-4var COOH-terminal-derived peptidomimetic anticancer drugs. Vandercappellen J, Liekens S, Bronckaers A et al., Mol Cancer Res. 2010 Mar;8(3):322-34. doi: 10.1158/1541-7786.MCR-09-0176. Epub 2010 Mar 9. A potent inhibitor of endothelial cell proliferation is generated by proteolytic cleavage of the chemokine platelet factor 4. Platelet factor 4 (PF-4) is an archetype of the "chemokine" family of low molecular weight proteins that play an important role in injury responses and inflammation. From activated human leukocyte culture supernatants, we have isolated a form of PF-4 that acts as a potent inhibitor of endothelial cell proliferation. The PF-4 derivative is generated by peptide bond cleavage between Thr-16 and Ser-17, a site located downstream from the highly conserved and structurally important CXC motif. The unique cleavage leads to a loss of one of the structurally important large loops in the PF-4 molecule and generation of an N terminus with basic residues that have the potential to interact with the acidic extracellular domain of the G-protein-coupled chemokine receptor. The N-terminal processed PF-4 exhibited a 30- to 50-fold greater growth inhibitory activity on endothelial cells than PF-4. Since endothelial cell growth inhibition is the only known cellular activity of the cleaved PF-4, we have designated this chemokine endothelial cell growth inhibitor. The N-terminal processing of PF-4 may represent an important mechanism for modulating PF-4 activity on endothelial cells during tissue injury, inflammation, and neoplasia. Gupta SK, Hassel T, Singh JP. A potent inhibitor of endothelial cell proliferation is generated by proteolytic cleavage of the chemokine platelet factor 4. Proc Natl Acad Sci USA. 1995;92(17):7799-803.